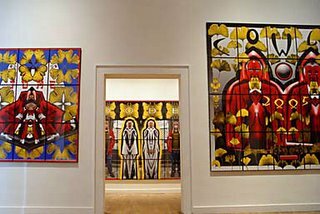 Last September I visited the Venice Biennale in Venice, Italy, and took photos of the Ginkgo Pictures by Gilbert & George, some are below . 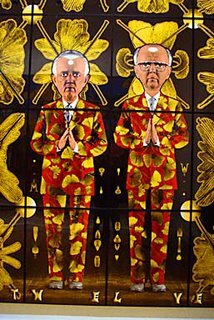 Gilbert & George, feted among Britain's best-known contemporary artists, represented Britain at the 51st Venice Biennale of International Art 2005 and presented for their exhibition in the British Pavilion: GINKGO PICTURES. Why Ginkgo? G&G: "It represents something bigger, like the sun and the moon." New York Times: "The Tate in London bought "Fates," the show's centerpiece, for more than $350,000. 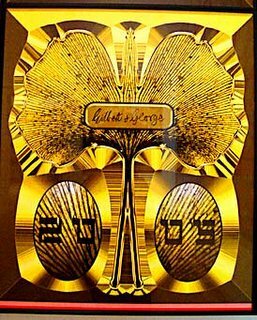 Using sophisticated digital editing techniques, the artists have created a series of pictures, each of which contains the leaves of a Ginkgo tree, the symbol of life. They are posterlike works that include photo realist images of the artists themselves in a variety of poses making a variety of faces." More photos on my website: click here.